Kim Jong Un slammed “hostile forces” that imposed sanctions on his country, North Korean state media reported Thursday, just hours before a crucial South Korea-U.S. summit in Washington. Kim vowed to continue socialist economic reforms “so as to deal a telling blow to the hostile forces who go with bloodshot eyes miscalculating that sanctions can bring the DPRK to its knees,” the official Korean Central News Agency reported, using the country’s official acronym. Later Thursday, South Korean President Moon Jae-in will visit the White House, where he is expected to push U.S. President Donald Trump to ease sanctions on North Korea in a bid to revive nuclear talks with Pyongyang. FILE - South Korean President Moon Jae-in waves as he is welcomed by U.S. President Donald Trump to the White House in Washington, May 22, 2018. 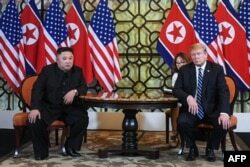 The negotiations have been stalled since a February Trump-Kim meeting in Hanoi ended without a deal, in large part because of a disagreement over the pace of sanctions relief. North Korean officials have said Kim will soon decide whether to quit the U.S. talks and restart nuclear and missile tests. That announcement could come this week during a session of North Korea’s rubber-stamp parliament. Pyongyang often uses such meetings to make major policy announcements. So far, Kim has refrained from making any especially fiery statements, suggesting he may wait for the outcome of the U.S.-South Korea summit. Trump remains publicly optimistic about the talks, stressing that his close relationship with Kim may ultimately result in a nuclear agreement. FILE - U.S. President Donald Trump and North Korea's leader Kim Jong Un meet during the second U.S.-North Korea summit at the Sofitel Legend Metropole hotel in Hanoi, Feb. 28, 2019. But behind the scenes, U.S. negotiators do not appear to be making progress. The Washington Post reported late Wednesday the United States and North Korea have not held working level talks since the collapse of the Hanoi summit, and that North Korean officials have not responded to requests for further dialogue. An Asia policy specialist briefed by the White House confirmed to VOA that U.S. officials have tried to contact their North Korean counterparts through the so-called “New York channel,” the North’s United Nations mission in New York, but have not received replies. North Korea may also be preparing for a provocative military parade, according to commercial satellite images analyzed by the Center for Strategic and International Studies’ Beyond Parallel program. The group says images from earlier this week show military vehicles gathered at a parade training facility in Pyongyang. “Although (the images are) not conclusive, North Korea may be preparing for a parade to honor Kim Il Sung’s birthday (April 15) or Korean People’s Army (KPA) Foundation Day (April 25),” said Beyond Parallel. Despite the faltering talks, U.S. Secretary of State Mike Pompeo has said he is hopeful Trump and Kim can soon meet for a third summit to break the deadlock. Trump and Kim first met in Singapore in June 2018. The two leaders agreed to work toward the denuclearization of the Korean Peninsula, but U.S. officials later conceded the two sides have not agreed on what that means. North Korea wants the sanctions relief to come in phases, as it makes concessions on its nuclear program. But U.S. officials have said they will not lift sanctions until North Korea completely gives up its nuclear weapons. 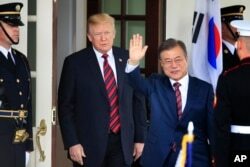 South Korea’s Moon prefers Trump take the phased sanctions approach. He is also trying to get U.S. support to resume inter-Korean projects, such as the Kaesong Industrial Complex or tours of North Korea’s Mount Kumgang. “Moon has reached the limit on inter-Korean projects he can put in place without sanctions relief, or without causing tensions in the U.S. South Korea alliance,” says Chung Min Lee, a senior fellow at the Carnegie Endowment for International Peace. Moon is set to meet separately with Pompeo and Vice President Mike Pence Thursday before meeting with Trump. Ahead of the summit, an official with South Korea’s presidential office said Seoul hopes to use the meeting to “quickly revive momentum” in the nuclear talks.